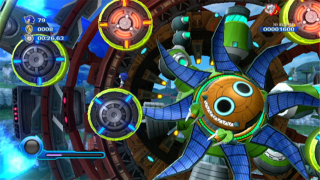 If you were looking for the boss in the DS version, see Drillinator. Refreshinator is basically Rotatatron 2.0. The fight is mostly the same, with the difference being instead of there being platforms, there are now rotating balls which you can use the Spike Wisp to grab onto to reach the middle and hurt the boss.